BALTIMORE, Md — Local students are coming together to honor those killed in the attack in New Zealand. 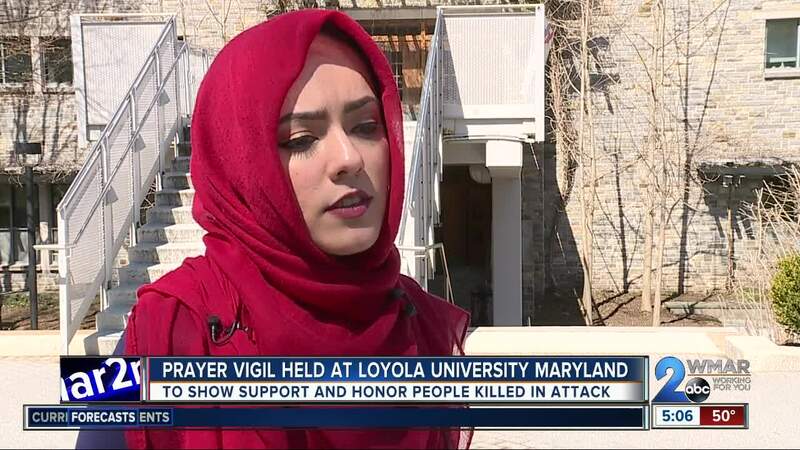 Loyola University Maryland held a prayer vigil Tuesday to show love and support for Muslims. A gunman opened fire on Friday during prayers at two mosques in the most deadly massacred in New Zealand's history. The two attacks killed at least 50 people and wounded dozens more. "How do you feel safe in an environment when you are a minority," Shahirah Khan, a senior at Loyola, asked. "Well you might not feel comfortable because hate can happen anywhere. It can happen abroad. It can happen in the city next to you. How do you feel safe when there's a history of hate crimes and it's becoming more predominant as we progress? How do you feel safe in that environment? I think the best way is to show that there are people coming together to support you. If you feel safe in your community then you are safe with others because they're putting in that care for you." Attendees at the vigil rang a singing bell for every person that died in the attack.